After all the votes were tallied, a clear winner emerged in this year’s Wildlife in North Carolina Photo Competition. Anton Sorokin, a graduate student at East Carolina University, captured the top prize with his beautiful photo of a rough green snake. 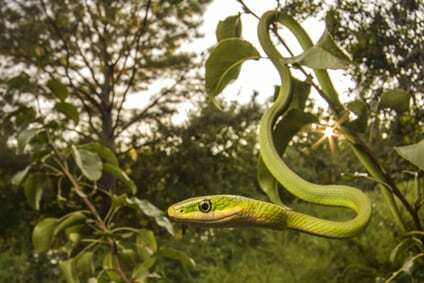 “It was late evening when I saw a rough green snake hidden in the foliage of a low branch in Pitt County,” said Sorokin. “I was using a wide-angle lens so I could include the habitat in the photo, which meant that I needed to get close to the snake. Moving slowly so as not to startle the snake, I got into position. Rather than being startled, the snake moved closer to investigate the lens. I was able to get the photo that I had in mind by framing the image to include the snake’s whole body and making sure that the sun wasn’t obscured by leaves or branches.” The judges for this year’s competition included Marsha Tillett, the Wildlife in North Carolina magazine’s art director, staff graphic designers Amy Friend and Bryant Cole, staff photographer Melissa McGaw and social media manager and photographer Thomas Harvey. Also serving as judge was Mike Dunn, a retired senior manager of outreach at the N.C. Museum of Natural History and a veteran nature photographer. “The depth Sorokin created through his use of angle and aperture, in combination with the warm hues and composition of the image, impressed the entire judging panel,” said Tillett. “The setting sun adds interest to the image, creating a secondary focal point. Sorokin was able to capture the beauty and grace of an animal most would generally describe as dangerous.” This win marks the second recognition of Sorokin’s work in the competition. In 2017, his photo of Southern toads mating took first place in the Animal Behavior category and his photo of a spadefoot toad received third place honors in the Reptiles and Amphibians category. All winning photographs, including Sorokin’s, will be on exhibit at the N.C. Museum of Natural Sciences in Raleigh and on the Commission’s website.